Is it possible to pursue your passions while growing your career at the same time? That’s a popular question for recent graduates entering the job market. After all, college is often the time where many people discover new passions for the first time. Tossing those passions aside for a 9-to-5 doesn’t sound like the most fulfilling approach to life. Starting out on your career after college shouldn’t feel like the beginning of a prison sentence. Considering 21 percent of the average lifetime waking hours are spent at work, the phrase “do what you love” shouldn’t just be something you have printed on a mug in your cubicle. It’s important to find a way to continue pursuing your passions, while also focusing on building a successful career. For some, that may mean the two intersect and your passion actually becomes your career. For others, it may be more about striking the right balance between the two and finding ways to pull your passion into your everyday work. The Vocate team knows how important it is to keep growing both personally and professionally and that’s why we’ve put together these three different strategies for feeding your passion while also growing your career after college. You’ll learn exactly what you need to do to make sure your passions and your career receive equal attention after graduation. Most people assume if they could be doing anything with their life, it would be making money doing what they love. However, there are conflicting arguments about whether pursuing your passion as your job is actually a good thing. On the one hand, of course, it sounds like a dream to wake up every day and go to work at something you truly enjoy doing. On the other, jobs can be stressful. You’re often collaborating with other people, working on strict deadlines and tight budgets. Do you really want to bring the complexities of your working life into something that brings you pure joy? Ultimately, that’s a question without a right or wrong answer. The truth is, it completely depends on the person. No matter what, it’s something to consider when looking at careers after college. Often, the best jobs aren’t the ones directly in pursuit of your passion, but instead are jobs that align with your goals and help you maximize your passion outside the office. You can strike that balance by testing these three strategies. Here’s one of the best ways to find the same satisfaction from your career that you do pursuing your passion outside the office. At the core of any passion is a set of skills that can likely transfer to any number of different careers. Uncovering those skills and finding the right job where you can put them to work is often the easiest way to feel good about what you do. For example, let’s say your passion is stand-up comedy. Several nights a week, you get up on stage in front of a crowd full of strangers and tell stories intended to make people laugh and feel more connected. Public speaking. You’re clearly comfortable in front of a crowd. Customer-facing roles where you can be communicating with people on a regular basis would likely be a great fit. An eye for human behavior. Finding an idea that’s universal enough to make a room of people laugh requires a special eye for the things that unite people. That talent is rare, and plenty of businesses can benefit from leveraging that skill in their marketing or sales departments. Writing. Crafting a good joke requires a way with words. Copywriting and editing might be a career path you consider. The point is, there are a number of ways to bring the core skills behind your passion into the workplace. It’s just a matter of mapping your skills to jobs where those would be most valuable. If your work is completely unrelated to your passion (but you enjoy what you do), a smart approach is to start looping your passions into your work in small ways. For example, you might be pursuing a career in web design, but have a passion for photography outside the office. Maybe you start bringing your camera to work to document the day-to-day office life for the “About Us” section on your website. Maybe you have some unbelievably cool scenic shots from a recent vacation that you think would look killer on a landing page or in a new marketing campaign on which you’re working. Don’t be afraid to share your passions with your boss and coworkers and try to find opportunities to pull that work into your day job. Sometimes, the best way to feed your passion while growing your career is to find like-minded colleagues who also might want to feed the same passion. Let’s say you’re a fitness fanatic who absolutely loves marathon running. Chances are, there are a few other colleagues who also enjoy distance running and would love to join you. Even more likely is a group of coworkers who want to get in marathon shape, but need an expert’s help (and the motivation) to actually make it happen. First, it would allow you to pursue your passion. While you might not be running on work time, you’ll still find your passion aligned with your workplace, and that’s huge. Second, you’re likely to gain some recognition for organizing the group and helping support company culture. 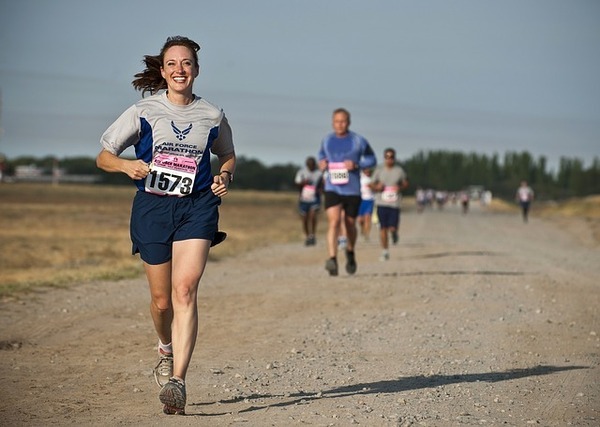 Maybe your company will pick up the tab on your marathon entry fees or, even better, recognize you have the initiative of a potential future leader and put you on a track toward career advancement. Starting a group at the office means pursuing your passion while possibly gaining some great visibility with leadership. Of course, if you find that the only way you can be happy is to take on your passion as a full-time career, find a way to make that happen. At Vocate, we’re of the mind that you can really have the best of both worlds, a fulfilling career that also feeds your passion every day. If you’re interested in uncovering the careers after college that best align with your passions, Vocate can help. With thousands of employers on our platform looking to hire recent graduates for entry-level jobs, you’ll have no problem getting paired with opportunities that align your career with your passions. Check out Vocate today to learn more.